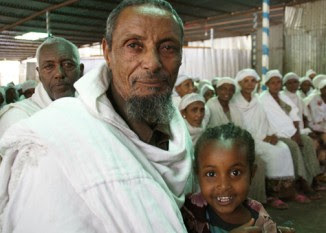 Ethiopian Falash Mura gather at the synagogue of a Jewish aid compound in Gondar, Ethiopia. NEW YORK (JTA) -- With the final planeload of Ethiopian immigrants scheduled to land in Israel early next month, advocates of Falash Mura aliyah are hoping a last-ditch intervention by Israel’s prime minister will extend immigration rights to thousands more. Former Israeli Supreme Court Justice Meir Shamgar held a closed-door meeting with Ehud Olmert in late May in a bid to convince the prime minister to order the immediate screening of an additional 8,500 to 8,700 Ethiopians for immigration eligibility. Also, a coalition of advocates is petitioning Israeli Knesset members, rallying American Jews and filing lawsuits to force Israel to take in thousands more Ethiopian immigrants. The campaign, launched several months ago, has taken on renewed urgency following several court rulings rejecting the advocates’ petitions, the termination of United Jewish Communities funding of aid activities in Ethiopia and the imminence of the planned end of mass Ethiopian aliyah. With more than 17,000 Ethiopian immigrants having come to Israel since Ariel Sharon’s government decided to expand mass aliyah from the country in 2003, the aliyah appears finally to be at its end. Israel’s Interior Ministry, which was responsible for verifying who was eligible for immigration, several months ago finished going through a list of potential Ethiopian immigrants dating back to 1999. That list is now closed, according to ministry spokeswoman Sabine Hadad. The UJC announced recently it had exhausted the $71 million it had raised and was ceasing its funding in Ethiopia. The national arm of the North American network of local Jewish federations had pledged $100 million to Ethiopian immigration and absorption as part of Operation Promise. The Jewish Agency for Israel, which coordinates the Ethiopians’ immigration and absorption in Israel, anticipates the final flight of Ethiopian immigrants will arrive in Israel in early July. “The Jewish Agency is winding down its activity based on the decision of the government to cease the current immigration of the Falash Mura at the end of June,” agency spokesman Michael Jankelowitz told JTA. But the coalition of activists pressing for additional Falash Mura aliyah says there actually are another 8,500 or so Ethiopians that the government should screen for eligibility. The activists say these were people on the 1999 list but remained in their rural villages rather than migrating to the Ethiopian cities of Gondar and Addis Ababa, where most petitioners congregated while Israel reviewed their cases and where they received Jewish aid. Israeli courts have rejected this argument, ruling that the government fulfilled its commitments dating back to the 2003 government decision and that the 8,500 Ethiopians represent a new group. Nevertheless, the coalition of activists is pressing on with its campaign, which began last December. At the heart of the controversy over Ethiopian immigration is the fear that mass Ethiopian aliyah will continue without end. Ethiopian aliyah was declared over by Israeli officials on several previous occasions, only to begin anew following public campaigns for its extension. In 2003, the government decided to verify the eligibility of an additional group of Ethiopians, subsequently capping the number. The decision reflected a desire both to bring Ethiopians with Jewish roots to the Jewish homeland and to limit the number of potential immigrants to those with legitimate Jewish links. Unlike the Ethiopian immigrants who came to Israel in Operations Moses and Solomon in 1984 and 1991, respectively, the Falash Mura were not practicing Jews until very recently. That has made it difficult to ascertain their claims of links -- either by heritage or marriage -- to Ethiopians of Jewish ancestry whose progenitors converted to Christianity more than a century ago to escape economic and social discrimination. In order to be eligible for immigration, the Ethiopians must demonstrate both that they have close kin in Israel as well as a maternal connection to a Jewish line -- or are married to someone who has. The Falash Mura must also agree to embrace Judaism as a condition of their aliyah. Rather than immigrating under the Law of Return, the Ethiopians qualify under a family-reunification statute, the Law of Entry. Some observers, including veteran Ethiopian immigrants, have warned that Ethiopians with dubious claims to Jewish ancestry are exploiting the system to escape Africa’s desperate poverty for a better life in Israel. But advocates of the Falash Mura say that except for a few isolated cases, those coming to Israel have legitimate Jewish links. In their current campaign, activists have developed a four-pronged approach focusing on Israel’s three branches of government and the fourth estate. Advocates are filing additional lawsuits and appeals, lobbying Knesset members for legislation expanding Ethiopian aliyah, urging the prime minister to issue a new order on Ethiopian aliyah and campaigning for public support. An Olmert spokeswoman, Gali Cohen, told JTA that the prime minister is interested in settling additional immigrants in Israel, including Ethiopians, but at this point there is no plan of action to extend Falash Mura immigration. Cohen said Shamgar’s meeting with Olmert was no more than a briefing. Meanwhile, Jewish aid funding to Ethiopia is drying up. The North American Conference on Ethiopian Jewry, which funds Jewish aid and education in Ethiopia, says it will stay the course, but its sponsors are pulling out. UJA-Federation of New York says it will continue to fund NACOEJ and its operations in Ethiopia, “pending a final decision by the government of Israel on who is eligible to make aliyah,” said David Mallach, the managing director of UJA-Federation’s Commission on the Jewish People. “If the decision of the Israeli government is final and Israel phases down the program, we’ll not continue funding programs for people who are not going to be making aliyah,” he said. NACOEJ's director of operations, Orlee Guttman, said the group will rely on grass-roots support if necessary. As for the uncertain future, the Ethiopian director of the aid compounds in Gondar, Getu Zemene, shrugs. "We will continue what we are doing," he told JTA.